This construction video is based on the detailed process for creating the design of a stair. Before starting the design, there should be clear ideas on riser and tread of a stair. The tread and the risers of stairs are considered as the inherent parts of the stairs. • The tread on each stair stands for the horizontal area where the foot is positioned while rising the steps. Generally, the depth of the tread is 9 inches as a minimum, but the number should be evaluated through your local building codes. If, treads on stairs are too broad, a second step is necessary to keep it to the next stair. • The riser stands for the vertical part of every step. The height of the riser is set by the distance among the treads on the stairs, but all stairs do not contain risers. Some stairs, like those utilized outside or in utility spaces, do not contain a board among the treads. As it is possible to view among the treads to the space under the stairs, these riser-less steps are called as open tread. Closed tread stairs contains risers contained within. To climb up easily, generally maximum height for risers should be around 8 inches, but this can differ with your area. While going to construct your own staircase, verify the local building codes on stair riser heights. N.B. : Installation for treads and risers install should be started at the bottom step. Initially, the riser and then the tread. If, possible each tread and riser should be connected jointly, glued, nailed and blocked at the bench individually, and the glue should be arranged prior to the stairs are put together. 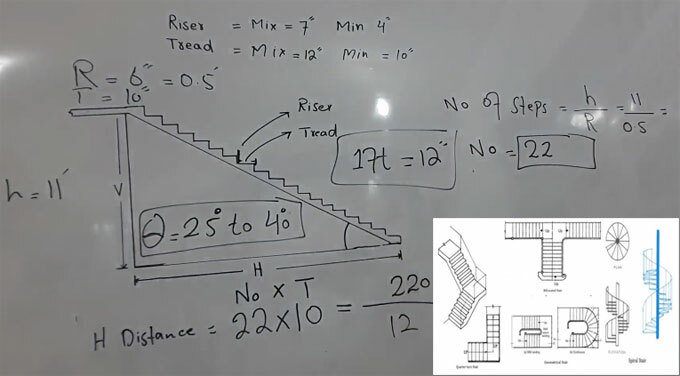 Go through the following video to learn how to calculate treads and riser for designing a staircase.